Governor Cuomo provided an update on the State’s preparation for severe weather related to Hurricane Joaquin. Waters flood the streets after Superstorm Sandy. Albany, NY - October 2, 2015 - Governor Cuomo provided an update on the State’s preparation for severe weather related to Hurricane Joaquin. Additional resources and personnel from various state agencies are being deployed to assist state and local crews with both preparing for and responding to the possible impact of the storm. New Yorkers are encouraged to sign up for NY-Alert in order to receive immediate notifications on flood warnings and severe storms, as well as follow @NYGovCuomo and @NYGov on Twitter for official updates. The State Department of Transportation has 110 job sites in the downstate region that are being assessed for readiness and will be secured as necessary. NYSDOT staff is clearing and assessing culverts as well as inspecting job sites throughout the downstate region – specifically 240 personnel in the Hudson Valley, 20 personnel in New York City, and 200 personnel on Long Island. Additional staff is providing support to sandbag filling efforts led by the Division of Homeland Security and Emergency Services. Additionally, NYSDOT is repositioning 20,000 more sandbags to the Hudson Valley for deployment as needed. State Police will be staffing the State Emergency Operations Center around the clock, and Troop personnel are ready for assignment to county and local Emergency Operations Centers (EOC) as needed. 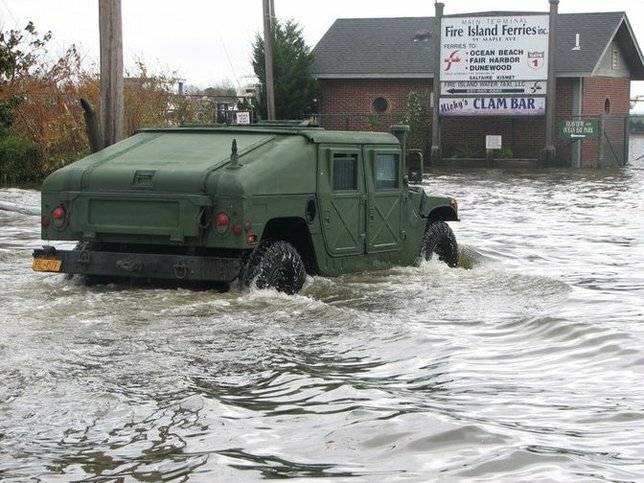 All emergency power and communications equipment has been tested, and all necessary equipment has been staged for quick deployment, including aircraft, rescue boats and four-wheel drive vehicles. On Tuesday, the Canal Corporation issued a Notice to Mariners advising of probable high water and canal closures related to heavy rainfall and then-Tropical Storm Joaquin. An updated notice was issued yesterday after Joaquin was upgraded to a Category 3 Hurricane. The Corporation is making preparations to offer safe harbor of refuge within the Waterford Flight late this weekend to commercial and recreational vessels. Marinas along the Mohawk River are also being notified of the possibility that movable dams will need to be removed as early as Sunday, depending on the development of Hurricane Joaquin’s forecast. There is 18 feet of storage available in the Hinckley Reservoir and Canal staff are drawing down levels and building additional storage where possible. The Corporation is coordinating closely with hydroelectric operators and other water management entities along or adjacent to the Canal relative to current and predicted flows, as well as with the New York Power Authority relative to the operation of the Hinckley Reservoir and other preemptive measures at Crescent and Vischer Ferry dams. Oil Spill Response Preparedness – DEC spills response staff are contacting Major Oil Storage Facilities operators to ensure that plans are in place to harden their facilities for the possibility of heavy winds, storm surge and flooding associated with a possible hurricane. Spills staff is also coordinating with its contractors to be ready to respond to oil and hazardous materials spills if needed. DEC has personnel and equipment working to clear streams at Normanskill Creek and Esopus Creek, and staff are working with local officials to monitor existing conditions and identify additional sites requiring debris clearance. NYPA is filling the upper reservoir at the Gilboa Power Project to create more space for the facility to accept water as the storm develops. All scheduled work throughout the NYPA system is being evaluated for potential impact amid the storm and nonessential projects are being postponed. NYPA’s generating plants, transmission system and operational staff are prepared to respond and adapt as weather conditions develop, and all resources required for safe, efficient operations (personnel, equipment, vehicles, etc.) have been put in place or placed on standby. 150 operations staff conducting storm preparations, to include building a berm of sand 4 feet high by 8 feet wide and approximately one mile long in front of Jones Beach. Preparing sand bags to be placed around several beachfront buildings and removing all trash receptacles, signs and unsecured items from the beachfront at Jones Beach, Robert Moses, Orient and Hither Hills state parks. Securing windows and doors with plywood and securing all equipment at Jones Beach and Robert Moses. Assembling and fueling all needed emergency response equipment, protective clothing and vehicles at all state parks across the Hudson Valley, New York City and Long Island. Continuously monitoring culverts and other flood-prone areas for debris at all state parks across the Hudson Valley, New York City and Long Island. Starting to lower lake levels in the potentially affected areas of Harriman State Park, to prepare for the additional inflow of stormwater. 550 operations staff and Park Police are on the ready to assist State Police and DOT as needed. Providing a staging area at Bethpage, Valley Stream, Hempstead Lake and Sunken Meadow State Parks to PSE&G utility crews. Subject: LongIsland.com - Your Name sent you Article details of "Governor Cuomo Issues Update on Storm Preparations"